AN EXCITING, FUN-FILLED BRAND– Chickapig first launched as a grassroots board game in 2016 by game creator Brian Calhoun (of Rockbridge Guitar) and musician Dave Matthews. Due to the game’s immediate broad appeal, original quirkiness and marketability, Chickapig quickly evolved into a full-fledged brand. In addition to the game, a new children’s book, Little Joe Chickapig, will be released March 10 alongside a Chickapig plush toy; exclusively available in Target stores. You are in charge of a flock of Chickapigs. Strategically move your Chickapigs across the board to pass through the goal on the other side. Along your way, do everything you can to thwart your opponents. And beware of the pooping cow! Why do your Chickapigs want to cross the board? To get to the other side. Duh! You want to get your entire flock of Chickapigs off the board by escaping through your goal, which is located directly across from your 6 Chickapigs. Chickapigs move in a straight line (forward, backwards, or sideways). They cannot move diagonally. Once they start moving, they can’t stop until they encounter another Chickapig, a hay bale, the cow (and cow fence), the perimeter of the game board, or the sides of the goals. The Chickapig stops in the space adjacent to whichever object it has encountered. One move is counted every time the Chickapig moves to encounter an object. You can only move your own color Chickapigs. You cannot move your Chickapigs inside the other players’ goals. Hay bales are used offensively to help your Chickapigs find their way into your goal. They are also used defensively to block your opponents’ Chickapigs from getting to their goals. Hay bales may be moved one space at a time (forward, backwards, or sideways). Diagonal movements are not allowed. One move is counted every time the hay bale moves one space. Hay bales can be moved to any open square on the board, including inside the goals. You can only move your own color hay bales. When a player rolls a 1, they have the option to pick up the cow and place it in any open square on the board. The first player that rolls a 1 and chooses to move the cow also removes the cow fence from the board for the remainder of the game. When the cow is placed on an open square, it poops, and a poop is placed beneath the cow. During normal game play, the cow moves one square at a time, just like the hay bales. The cow cannot move diagonally. One move is counted every time the cow moves one space. The cow does not poop when moved during normal game play; it only poops when a 1 is rolled and it is placed on an open square. Any player can move the cow during their turn. Cows like poop, Chickapigs do not! When the cow poops and then moves again, the poop stays in the square where the cow left it. When you pass over a poop with a Chickapig or hay bale, remove the poop from the board and take a Poop Card. The Poop Card is read out loud and enforced at the end of the player's turn, then is shuffled back into the deck. All of the POOP CARDS are bad because no one wants to step in poop. Chickapigs do not stop at poops, but slip right through them until they hit another object. The cow can travel back over its own poop with no consequence, but it cannot double poop in one square. When you roll a 2, you have the option of taking a Daisy Card instead of using your 2 moves. All the Daisy Cards are good. Keep the Daisy Card a secret and use it at any point during the rest of the game (while it’s your turn). You can only hold one Daisy Card at a time, and you cannot play a Daisy card on the turn that you pick it up. After you play a Daisy Card, shuffle it back into the deck. One slow Chickapig player can really slow down the fun. Whether you use the included hourglass or set your own timer, feel free to impose a specified time per move to keep the game rolling along. 1. Set up the board like the diagram. 2. Roll to determine who goes first. Highest roll goes first and then play continues clockwise for the rest of the game. 3. Roll to see how many moves you get, and move your pieces as defined above. Whatever number you roll represents the total number of moves you have on that turn. You are free to move any of your pieces (or the cow) in any order until you’ve reached your move limit. You must reach your total move limit. Coordinate your Chickapigs and your hay bales to quickly get all of your Chickapigs into your goal. The first player who gets their entire flock of Chickapigs into the goal wins the game. 4. Block your opponents’ goals with your own Chickapigs, hay bales, and the cow. Whenever possible, poop in other players’ goals and other areas their Chickapigs might have to cross over. 5. It is illegal to completely block a goal of another player. There must always be at least one way into a goal for every chickapig. An illegal block can consist of a combination of Chickapigs, hay bales, etc., anywhere on the board that completely blocks access to one’s goal. No illegal block exists if a player can access a goal by moving one of his/her own pieces (or the cow), no matter how many moves that may take. See diagrams for example of opening move for Red if a 6 is rolled. Click here to download a pdf of the 2-player instructions. Want to really test your skills? Try 2-player Chickapig, where skill will triumph almost every time no matter how good or bad your rolling is. 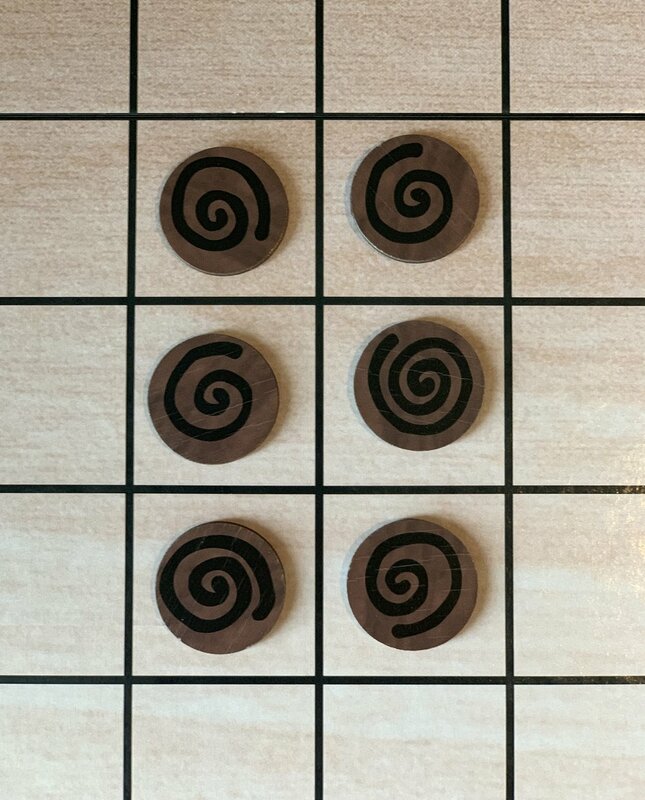 It's simple; all rules from standard 4-player Chickapig apply, but turn the board diagonally so that each player controls two adjacent flocks of Chickapigs. During your turn you may move either of your two colors in any order, but Chickapigs still have to go into their own color-coded goals. First player to get 10 Chickapigs into their goals wins the game. I remember playing board games with my family growing up. I also remember going to friends’ houses and finding that they played the same board games with slight variations on the rules. I believe house rules are a big part of board games. In an effort to avoid having the Chickapig instructions read like a long novel, we’ve left a few small questions unanswered. A few examples are below. Figure out your own house rules and enforce them when your friends play on your turf! WHAT HAPPENS IF ALL THE POOP TOKENS ARE ALREADY ON THE BOARD AND THE COW POOPS AGAIN? If you’re playing with me, pick up a poop that’s already on the board and place it under the Cow. After all, in real life some poop just decomposes before someone steps in it. I’ve seen other people say the cow can’t poop anymore! IF YOU HAVE A DAISY CARD THAT DOUBLES YOUR ROLL, CAN YOU DOUBLE A 1 AND POOP TWICE? IF YOU ROLL A 2 AND ALREADY HAVE A DAISY CARD IN YOUR HAND, CAN YOU PLAY THE CARD FIRST AND THEN USE YOUR 2 TO SNAG ANOTHER ONE? Due to the nature of the Daisy Cards, this would rarely be good strategy, but if you’re playing with me, sure thing! WHEN SOMEONE WINS THE GAME, DO YOU PLAY FOR SECOND PLACE? There is no second place in Chickapig if you play in my house! IF YOU CAN ONLY MOVE 2 BECAUSE OF A POOP CARD, BUT YOU HAVE A DAISY CARD IN YOUR HAND, CAN YOU USE YOUR DAISY CARD IN CONJUNCTION WITH THE MOVE 2? CAN YOU USE THE FLYOVER CARD TO FLYOVER THE COW WHILE IT’S STILL IN THE FENCE?